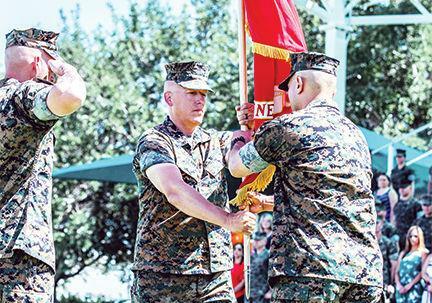 Lt. Col. Erick T. Clark relinquished his role as commanding officer to Lt. Col. Robert M. Barnhart Jr. during the change of command ceremony for 1st Battalion, 7th Marine Regiment aboard the Combat Center on Monday. Col. Kyle B. Ellison, commanding officer, 7th Marine Regiment, said how professional and exceptional Clark had been during his time as commanding officer of 1/7. During the ceremony, Marines and sailors with the unit performed drill, colors were exchanged and the ceremony concluded with a pass in review. The exchange of colors, from an outgoing commander to an incoming one, is the crowning moment of the ceremony and ensures that the unit and its Marines are never without official leadership and also promotes a continuation of trust. Clark first enlisted into the Marine Corps in 1991 and commissioned into the Marine Enlisted Commissioning Education Program in December of 1998 after reaching the rank of sergeant. His personal decorations include the Bronze Star Medal with Combat “V,” Defense Meritorious Service Medal, Meritorious Service Medal (with one gold star), Navy and Marine Corps Commendation Medal with Combat “B” (with two gold stars), Navy and Marine Corps Achievement Medal and the Combat Action Ribbon. “Once you’ve served with 1/7, everything is secondary,” Clark said. Before passing the microphone to Barnhart, Clark stated his trust in Barnhart to carry out the billet of commanding officer. In Barnhart’s first speech to his new battalion, he expressed his respect and dedication to serving alongside the Marines of 1/7.